Megan Allen looks for a passing lane during Butler’s win over Greenville on Wednesday. Jacie Dalton makes a pass during Butler’s win over Greenville on Wednesday. Tyree Fletcher puts up a shot during Butler’s win over Greenville on Wednesday. Abbie Schoenherr drives the lane during Butler’s win over Greenville on Wednesday. 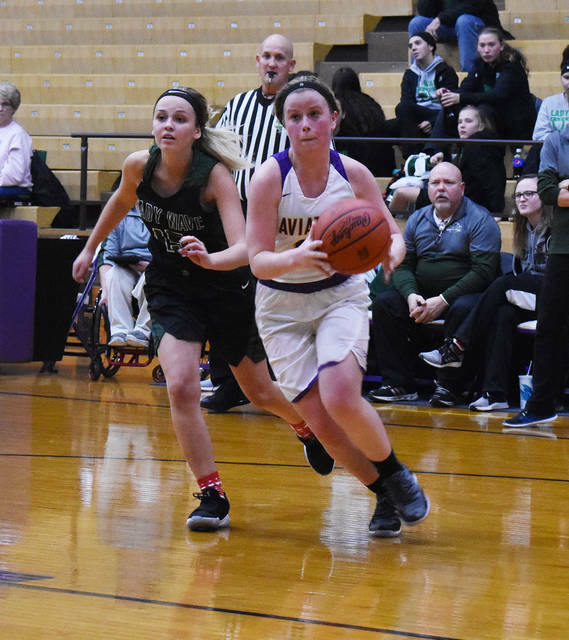 Gracie Price hit four three-pointers and scored a career-high 16 points to lead the Butler Lady Aviators to a 38-19 win over Greenville on Wednesday. 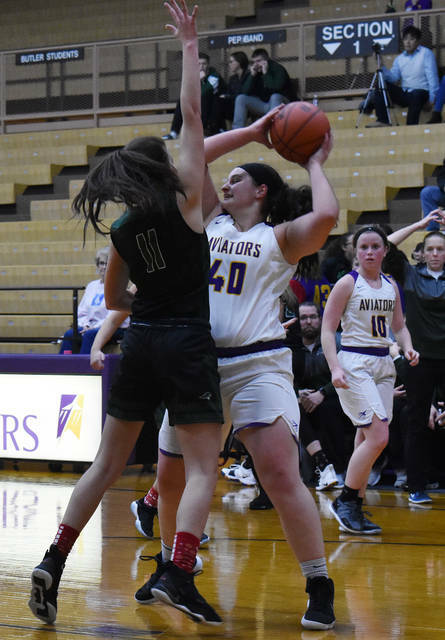 VANDALIA — The Butler girls basketball team used a stingy defense and a career-high 16 points from Junior Gracie Price to double up the visiting Greenville Green Wave on Wednesday night. 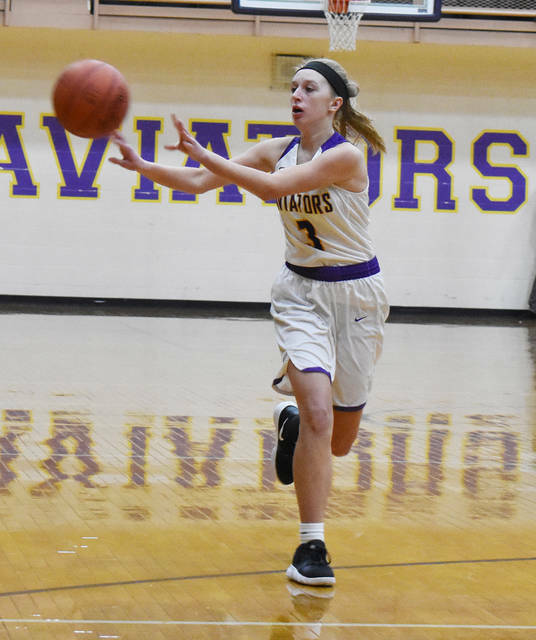 With the win, the Aviators improved to 3-1 overall and 2-0 in the Greater Western Ohio Conference North Division while the Lady Wave dropped to 1-3 overall and 0-2 in the division. Indeed, the Aviators overwhelmed Greenville from the start in jumping out to a 15-2 lead in the first quarter. 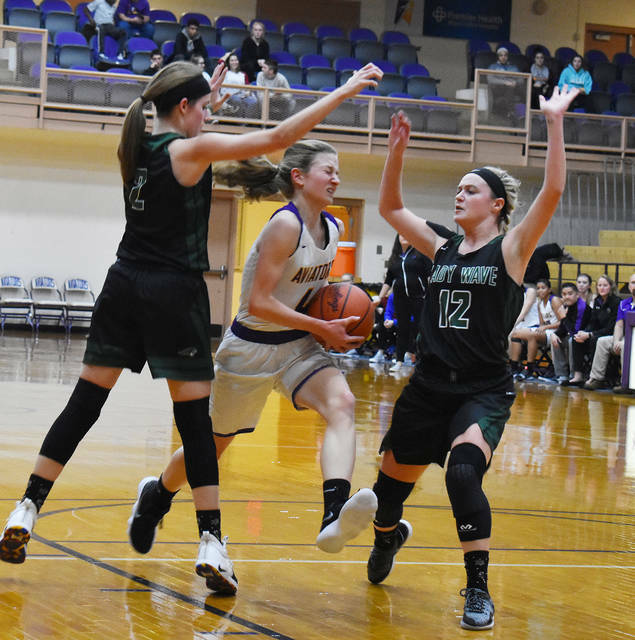 After the Wave took a brief 2-0 lead, they didn’t score a point the rest of the period while Price connected on two of her four three-pointers and Abbie Schoenherr added five points including a three. Greenville turned the tables on the Aviators in the second quarter, however, and Butler let the Wave back in the game. 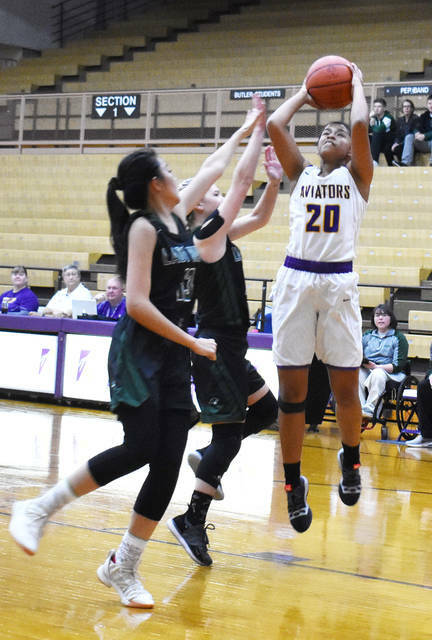 Greenville held the Aviators without a point for the first four minutes of the quarter and then used a pair of three-pointers by Jada Garland to cut the Aviator lead to 19-14 at half. The Aviators came out with a renewed zest for defense after the half and held Greenville to just a single free throw in the period. Baskets by Tyree Fletcher and another three by Price pushed the Aviators to a 31-15 lead heading to the final period. Schoenherr, Fletcher, and Price’s final three pointer accounted for the rest of Butler’s scoring as Butler held Greenville scoreless over the first 5:30 of the final period. Price added four rebounds and a pair of steals to go with her game and career-high 16 points. Fletcher had 9 points, seven rebounds, and six steals in a good all-around effort. Schoenherr also had 9 points four assists, three rebounds, and two steals. Butler will travel to Springfield (3-1) at 1:30 p.m. on Saturday.